Could This Number Be a Killer for Natural Gas Vehicles? T. Boone Pickens has pointed at lack of rigs producing natural gas as a potential problem for industries that rely on cheap gas and dependable supply. What does this mean for Clean Energy Fuels, and will companies like Ultra Petroleum turn the tide to meet growing demand? "There are 1,850 drilling rigs running in the United States today ... 350 of them are on natural gas, and 1,500 of them are on oil. It's because the oil price is $100 a barrel, so the rigs work where they can make the most money. It all makes sense -- 350. What's going to happen is, as your rig count has gone down, your production of natural gas will go down also. As it goes down, the price goes up." Those of you who've followed my writing know that I'm relatively bullish on the prospects for natural gas vehicles, and also on companies such as Clean Energy Fuels (NASDAQ:CLNE) and other companies producing engine technology that's making the shift from gas and diesel a reality. Yet while we have started to see some momentum in heavy trucking over the past year, the increase in demand for natural gas so far isn't being met with an increase in production, while oil production continues to grow. A lot of this situation comes down to producers such as Ultra Petroleum (NASDAQ:UPL) and Chesapeake Energy (NYSE:CHK). While they have historically focused on natural gas production, they're now increasing oil output, while their natural gas production is declining. What will the repercussions be for natural gas vehicles, and the companies like Clean Energy Fuels, which rely on a steady and cheap supply of natural gas? Let's take a deeper look. 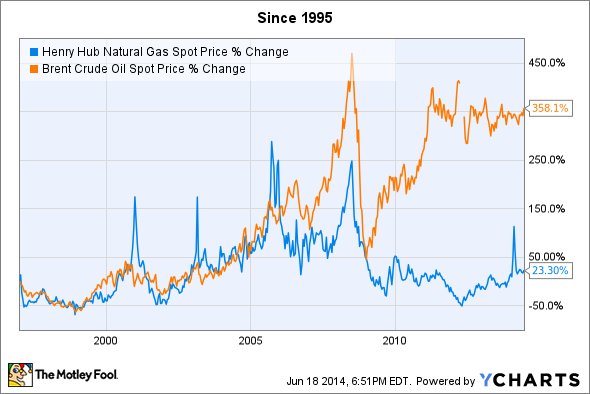 Natural gas and oil prices in the U.S. move independently of one another. That's largely because oil trades as an international commodity -- we import a significant amount of it -- while natural gas is almost 100% domestically produced. Natural gas prices tend to spike in the winter, when use for heating adds to the total demand and causes the occasional short-term supply pinch. Those pinches are usually very regional, and largely driven by extreme weather conditions, which can both increase demand and affect production. The notable exception is the spike in 2006 and 2007, when there was real concern that domestic reserves were running out. Of course, advances in horizontal drilling and fracking have allowed producers to unlock the gas (and oil) located in shale rock, and now domestic reserves, by most estimates, exceed 100 years. The race to develop those reserves sent prices to historic lows, and at those levels, producers were losing money, which is a big reason Ultra Petroleum and Chesapeake Energy began acquiring and developing oil assets. Simply put, they needed to diversify their income sources to prevent future overproduction from causing big losses. In a nutshell, the law of supply and demand is working. Overproduction pushed prices so low that nobody could make money, even Chesapeake and Ultra Petroleum, both of which have been relatively efficient at getting gas out of the ground cheaply. And as long as the U.S. continues to import oil -- the 2012 level was 7.4 million barrels per day net-- there will be a market for domestic crude oil to offset imports. On the flipside, the decreased production of gas has led to rising prices, which is good for all of the producers that were losing their shirts when natural gas was $2 per mcf, just a few years back. The problem, of course, is what the implications are for companies like Clean Energy Fuels. This is something I've written about several times, but it's always worth bringing up again. Natural gas "at the pump" is less affected by the spot price of natural gas than the price of gasoline and diesel are affected by the price of oil. The basic math is that that each mcf -- which is 1,000 cubic feet -- of natural gas is equivalent to 8 gallons of gasoline. That means each $1 per mcf is about $0.12 per gallon. The rest of the "at the pump" cost of natural gas is based on transportation and preparation costs, which is why natural gas in Oklahoma -- the center of the shale gas revolution -- costs much less than it does in, say, California or Florida. Simply put, transporting the fuel can cost as much as the gas itself. 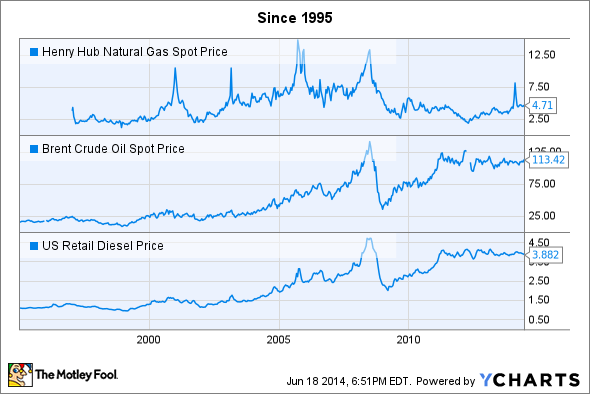 In short, a natural gas spot price of $4.71 means the per-gallon cost of the natural gas itself is about $0.59. If gas prices went up to $6 this winter -- almost 30% higher -- it would only increase the "per gallon" equivalent cost about $0.16 for natural gas vehicles, or about 5% at the pump. This is the key takeaway that I want to stress. The supply is there, and the efforts by Ultra Petroleum and Chesapeake to shift production to oil isn't the same thing as having these companies turn their backs on natural gas, which still makes up more than 70% of the production for both companies today. It's a matter of the economics, and Ultra Petroleum and Chesapeake Energy are likely to develop more gas resources, especially as demand growth proves sustainable . Understanding the economics of Clean Energy's business can help you invest better. If the market sends Clean Energy down on news of higher natural gas prices, understanding what the business impact really is gives you an advantage. As long as the material results -- deliveries of CNG and LNG especially -- continue to grow, seasonal volatility in gas prices is less important than most people think, and if it sends Clean Energy shares lower, it could be a buying opportunity. For Chesapeake and Ultra Petroleum, higher gas prices are a good thing. These could be the two best domestic gas producers, and their oil assets are a valuable hedge against a decline (however unlikely) in natural gas prices.